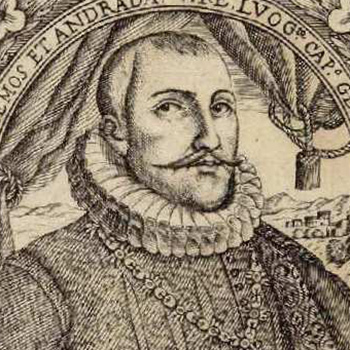 Fernando Ruiz de Castro, Sixth Count of Lemos and Third Count of Andrade, was at the head of the feudal hierarchy in Galicia. As such he was commissioned by the Marquis of Cerralbo to lead the reinforcement troops. His performance was satisfactory and he got the most out of his Galician troops, consisting of landowners and their respective vassals. He did so much damage to the English that he set up the battle of El Burgo bridge, where he wore down the best of Elizabeth’s army. His main fault was not to have imposed his will on the captains of the galleys and thereby bring in reinforcements to Corunna. Philip II and later Philip III held him in high regard, and he was appointed Viceroy in Naples, where he died in 1601.